Veterans Affairs, veterans benefits eligibility assessment, and much more. which you can fill out and submit, either electronically or by mail. It is important to understand that you are responsible for preparing and submitting your own claims for benefits. that provide free claims certification and legal services should you require additional, individualized assistance. 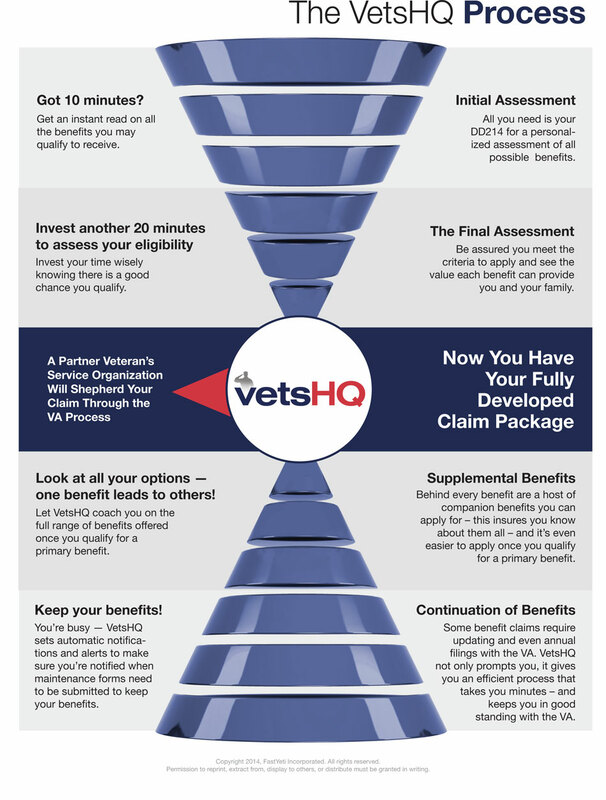 The information you provide on the VetsHQ questionnaires will be used to identify a list of benefits that may be of interest to you. You should read all of the information about these benefits carefully and decide whether you wish to apply. As a member, you’ll be able to get additional information about the type of benefit selected and who qualifies for it. If you believe that you qualify for a benefit and you decide to apply, a link to the necessary questionnaire and forms are provided to you. The answers you provide on questionnaires will auto populate any applicable forms for benefits. Or, you may choose to fill out a blank form . Whichever method you decide, double-check the information on your forms for accuracy. Once you have prepared your claim for benefits, you may choose to print it out and mail in to the VA, along with any supporting documents required. Or you will be able to choose a claims coach or a Veterans Service Officer who can assist you with the filing process.